Imagine a Joel Rosenberg and Tom Clancy collaboration, add intensity, and you have Jeff Nesbit's Peace. 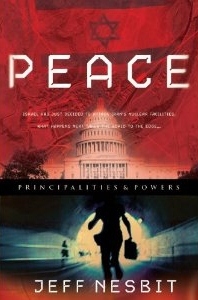 A page-turner that blends a geo-political-techno thriller with human interest and spiritual introspection, Peace offers a realistic look at the fragility of the Middle Eastern balance of power, if it can be considered a balance. Sound dry? Oh my, no! What carries Mr. Nesbit's work beyond a scholarly treatise in Foreign Affairs is a gripping storyline that spans the gamut from the pristine Oval Office to a squalid covert prison camp in North Korea, the ornate halls of the Kremlin to a dusty tribal village in Malawi. What's surprising in that lopsided contrast is just who exerts more influence over the outcome of the story. If you like international thrillers that take you through scenarios seemingly impossible to resolve--but plausible to conceive--drenched in suspense and intrigue, you've got a treat in store for you in the pages of Peace.